Today we're happy to announce that Easy Allies reviews are now featured on Metacritic. Since we recently finished the update on our reviews page, I got in touch, and after a quick phone call, they promptly started adding our reviews. I was surprised to find out that not only was it unnecessary to explain who we are, but the team at Metacritic already has a lot of respect for our work. It was really just about reaching out and making that connection. They also work closely with Game Rankings and are in the process of having our reviews added there as well. Thanks to all of our patrons for your continued support in allowing us to keep making reviews at the same high standards we always have. 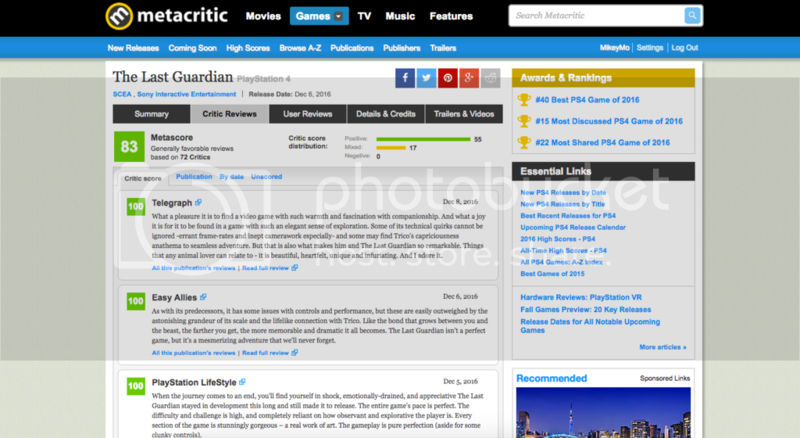 You can see our Metacritic profile page at the link below. Great news, Blood! Congratulations! I just watched this week's EZA podcast and saw you talking about that with Kyle and the others. Hopefully this means even better tidings for you guys in the near-future like Kyle predicted. This great because you'll get more exposure as well, so it's not just a feather in your cap. Like it or not Metacritic is a huge gatekeeper in the industry, this can only be a good thing for EZA going forward. @GoTaco sadly EZA gloss over the control and camera issues and don't mark the game score down because of it, so ill not be putting any faith in future reviews from the reviewer. EZA should check out the Gameinformer talk about the game to see why it's not 5 stars. sadly EZA gloss over the control and camera issues and don't mark the game score down because of it, so ill not be putting any faith in future reviews from the reviewer. A review is someone's opinion on a game. It's not something objective. For example some people can be more sensitive to camera issues than others, as in one person can be more forgiving about it. They could also value certain elements of a game more (like say a deep combat system) over the other reviewer. Who is right in this instance according to you? The entire point of a review is that it is a person's experience and opinion on a game in written (or video) form. You read reviews to get a better understanding of a game. The more reviews you read the better. You fixating on the score of all things is beyond silly. But hey if that's how you roll then by all means. I don't think you get the concept of personal values. They actually do touch on that. It didn't resonate as a major flaw. @yungstar L&R despite differing opinions, however did you notice the part in the review where a hidden camera option that's not listed on the game controls screen was mentioned? I feel like other people reviewing the game missed this, and that's why they have had trouble with the camera. Control issues also possibly have explanation in the way the devs intended movement and interacting with a wild creature to feel. If you've ever had a pet, you know they don't always do exactly what you tell them to. you appear to be confused on what i said. try reading it again. i'd then suggest you take a look at the latest Gameinformer Show and Podcast Beyond where they discuss the problems with the game and why they could not give it 100% like EZA have done. @yungstar Making three separate posts replying to three separate people only saying to watch some video you agree with really isn't the best way to prove whatever point you're trying to make.